What happens when you add New Mexican chili powder to a traditional moelleux au chocolat? You get an intense chocolate dessert that makes you feel like you’re traveling continents by simply lifting your spoon. At first, you’re in France. You bite into tradition- smooth, rich chocolate. Then you’re transported across the Atlantic with a spicy kick- only for the most adventurous! A moelleux au chocolat was the first thing I wanted to make in the new oven. It’s a common French gateau, soft and moist inside and slightly drier on the outside. I first learned to make it a few years ago, thanks to a friend who passed me her recipe. I was still in grad school and at a huge loss for time, but even that couldn’t keep me away from the kitchen. I was planning a surprise for Sébastien and needed something easy, quick and, of course, decadent. The first recipe was a success and I’ve since been toying with it- making it my own. I’ve experimented with different doses of butter and sugar (preferring less to more) and different types of chocolate and cacao content (preferring more to less). When I made my moelleux au chocolat last weekend, I figured a new kitchen needed some real spice and decided to add the chili powder. My sister warned me not to add too much so it wouldn’t overtake the chocolate- fortunately, I listen to her! 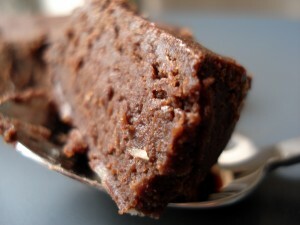 With or without the chili, this recipe for the moelleux has been my best to date. First, a note on chocolate: What kind should you use? Dark, quality chocolate. The minimum cacao content should be 50%. I’ve started using a combination when I cook. This time, I used two-thirds at 52% and one-third at 70%. Always avoid a high sugar content, as it corresponds to a poor cacao content. Also make sure your chocolate includes cocoa butter and not its substitute: vegetable or animal fat. *Adjust according to your taste buds and the chili you are using. I used medium-hot from Chimayo and it gave a good kick. 2. Slowly begin melting butter over low heat. 4. Put sugar in mixing bowl, add egg yolks and mix. 5. Begin melting chocolate in double-broiler. 6. Add butter to sugar/egg-yolk mixture and mix. 7. Combine flour, salt and chili powder, then add to the rest of the batter and mix. 8. Add melted chocolate and mix. 9. Beat egg whites until they are stiff and carefully fold into batter. 11. Cook until the edges begin to dry and break away from the pan (10 or more minutes). The inside should remain moist and stick to a knife when tested. Keep an eye on it and don’t overcook! A “fiery” moelleux au chocolat is best served warm, right out of the oven. This entry was posted in Recipes (All) and tagged chili, chocolate, dessert. Bookmark the permalink.